Canadian astronaut Chris Hadfield returned to earth on May 13, 2013, following a five month mission on board the International Space Station. 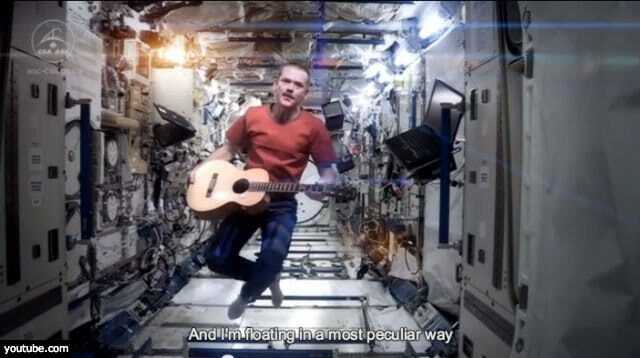 Before his return, Hadfield recorded a stunning music video – the first one ever filmed in space – featuring himself performing a cover of David Bowie’s hit song ‘Space Oddity’. 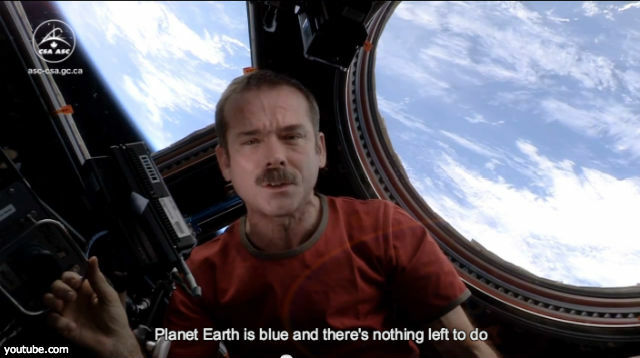 The video, which immediately went viral, shows the 53 year old astronaut floating around the cabin in mid-air, strumming a guitar and singing the Bowie classic with surprisingly dulcet tones. As he drifts around the zero gravity environment, incredible views of earth can be seen through the space station’s windows. The original version of the song was used by the BBC as part of its coverage of the Apollo 11 moon landings in 1969. Comander Hadfield became the first Canadian to command the ISS in March, 2013, and during his one of a kind mission he entertained, educated and directly communicated with a massive audience who avidly followed his daily reports via social media platforms such as Twitter, You Tube, Tumblr and Reddit. Indeed, in recognition of his effective mastery of social media, Forbes described him as “perhaps the most savvy astronaut ever to leave Earth”. David Bowie was clearly impressed with the celebrity spaceman’s version of his song. His official Facebook page posted a message calling it the most poignant version of the song and on Twitter, Bowie tweeted, “Hallo Spaceboy”, a pertinent reference to another of Bowie’s smash hits. A recording or performance of a previously recorded original song. one that usual appeared in an official music chart. Quickly gained massive popularity across the Internet. the strings or a stringed instrument. Judged over time to be of very high quality and outstanding of its kind. melodious and pleasing to the ear. ‘Dulcet tones’ is often used ironically. The treatment of an issue my the media. Websites and applications used for social networking. Profoundly moving; touching; evoking a sense of sadness or regret. relevant or applicable to a particular matter. with widespread popularity and huge sales. If you enjoyed this post and found it useful PLEASE tell us what you think and share on Facebook, Twitter or Pinterest. We really do appreciate it when you do! 🙂 We also love it when you leave us a comment below. Carrying a Guitar Will Increase your Chances of Getting a Date ……… if you’re a MAN! Yes that would be good – maybe next time he will. That would be another first!